Benyamin Ben-Akiva is, at the start of the book, the under shammes (assistant sexton) at the Klaus Shul (synagogue), the smallest shul in the crammed Prague ghetto in 1592. He had previously lived in Slonim in Poland, and had studied in Kracow but "was never mystical enough to suit the mystics, or rational enough to suit the rationalists, or compliant enough to become a follower of any of the established schools of thought." When his wife had left him he had followed her to Prague in the hope of re-establishing relations with her. He is described as “a tall Jew with a curly black beard", although he has noticed "a few prematurely grey hairs." He has "huge and paw like hands" and is very conscious of what he calls his "crude mannerisms". But he is courageous and determined, always ready to speak up for himself and he proves to be a shrewd and very well-informed investigator, well able to put his detailed knowledge of the Torah and the work of the scribes to good use. No wonder he ends up as a rabbi. He is particularly expert at talking himself out of difficult situations. He narrates part of the story, the rest being told in the third person. Kenneth (J A) Wishnia was born in Hanover, New Hampshire. After several years working in Scotland, France and Ecuador and elsewhere, doing everything from carpentry to opera singing, he was awarded a B.A. 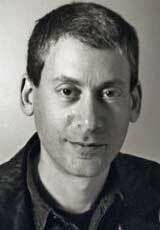 in literature and film from Brown University and, later on, a Ph.D. in comparative literature from SUNY Stony Brook. He teaches composition, literature and creative writing at Suffolk Community College on Long Island, where he is an Associate Professor of English and lives with his wife and their two children. 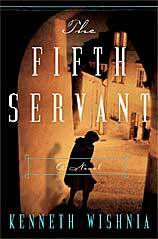 He had published five crime novels before The Fifth Servant (reviewed below), and his short stories have appeared in various magazines. It is in the over-crowded Prague ghetto in1592 that the bloody corpse of a young Christian girl, about seven years old, is found with her throat slashed, inside the store of Jacob Federn, a Jewish businessman. This triggers an iimmediate threat of mass retribution against the entire Jewish community. Benyamin Ben-Akiva, the newly arrived shammes (synagogue sexton), is given three days by the Christian local sheriff to prove that someone other than Federn is guilty of the girl's brutal murder. He faces opposition from his own people, but helped by his rabbi, Rabbi Loew, he sets off on a desperate search for answers which takes him from the forbidden back rooms of a ghetto brothel (complete with secret tunnel to let Christans in) to the Emperor's lavish palace where he is granted permission to make good use of the emperor's latest magnifying device, an early form of microscope. Eventually he gains access to the girl's body which he not allowed to touch but which reveals surprising evidence of what experiments prove to have been a pistol wound. It makes a gripping story brought alive by detailed descriptions of life in the ghetto, at a time when Jews had to wear the special yellow Jew badge before they were allowed to leave it, and when there was deep hostility between Christians and Jews, as well as in-fighting in the ghetto itself. And, despite all the misery and suffering, it is written with never-failing if sometimes bitter humor, as when we are told that “Spring is open season on Jews. Holy Week and Eastertide were especially risky, and a gambling man would say that we were long overdue for some old-fashioned Jew-hatred. Every year the Jews got thrown out somewhere. The lucky ones merely got beaten up, had their property stolen and, and escaped with the books and clothes they happened to be wearing at the time .... "
I enjoyed too the way that Benyamin, after examining the blood stains “planted myself with my legs apart and announced in my most authoritative call-to-prayer voice, 'The man who left the girl's body here was about six feet tall, and strong enough to lift ninety pounds with one arm. He wore eleven-inch long boots with pointed metal toes, one of which was slightly dented at the left instep.' "
And he goes on to tell the credulous Christian guards, “All I have to do is gather some of the dust from this spot, which contains tiny traces of the murderers' essences, bind it with a cloth and bury it in a shallow grave. And just as the dust cannot leave the place where it is buried so will the assassins be unable to escape the confines of the city until the knot is untied." While "the Christians watched wide-eyed ....Rabbi Loew drew in a sharp breath, but I kept going, waving my hand back and forth over the pouch while reciting a litany of oaths in Hebrew and Yiddish." Later, when “a man tugging on a couple of stubborn sheep mocked us by asking, 'Tell me, Jews, if you're so smart, what is this sheep saying? ', I listened to the animal's drawn-out bl bleating and said, “Help, I'm being pulled along by an idiot." At other times the humor seems more obviously Jewish, as when a Christian girl asks him, “How do you Jews keep track of all six hundred and thirteen commandments?" “It's a matter of knowing which rules to break." “And how do you know which rules to break?" “It takes practice. Don't forget, you people have only been Christian for  what? Eight hundred years or so? And we have been Jews for more than four thousand. So we've got a big jump on you." You cannot help sympathising even with such unpleasant characters as Bishop Stempfel when the doctor subjects him to " a complete examination of the digestive tract" using a painful probe consisting of “a hollow metal tube, with a flat projection at one end with a hole cut in it for viewing the exposed tissue". He eventually treats him by holding “the withered finger of a long dead saint" on the bishop's wound. But our sympathy soon disappears when he avidly joins in the terrible torture of a mother and daughter whom he has decided must be witches. The book is, the author explains, "written in modern American English, with bits of Czech, German, Hebrew and Yiddish thrown in to give a sense of the cosmopolitan flavor of late 16th-century Prague". This can present quite a challenge to the reader, but you soon get the sense of what is being said without having to consult the glossary that is hidden away towards the end of the book, and which does not include such obvious words as shammes and shul which you do need to understand. Admittedly, shammes is explained on one of the opening pages but I missed this! The only part that really lacks conviction is the creation of a Golem (actually a large simple-minded man on stilts) and the way marauding Christians flee from him. But the book is very well researched and has been written with considerable empathy for the wretched and persecuted, both Jews and Christians. And the snippets from the Torah and other religious teachings are both relevant and interesting. The only really superfluous part is the inclusion at the end of the paperback version of one of the two short stories that the author has written as follow-ups to the novel. Otherwise it all makes an engrossing and original read, and is to be recommended. The author has his own Kenneth Wishnia website. There is an interview with him on the Man of la Book blog. Please sign my GUEST BOOK. All comments, contributions (or corrections) welcomed! The book is handsomely designed although there is one oddity: the first few words of each section are printed in light grey and upper case, as shown below, making them just that much more difficult to read. I found this an annoying distraction.